The San Juan was some 270 miles off Argentina's Patagonian coast when it sent its last signal. BUENOS AIRES — The Argentine Navy submarine that went missing a year ago off the country's Atlantic Coast was found by a private company involved in what had been a massive search for the vessel and its 44-member crew, the Navy announced by tweet on Saturday. The submarine ARA San Juan had a seven-day supply of air when it last reported its position on Nov. 15, 2017. It was found some 2,625 feet below the ocean's surface by a marine tracking contractor Ocean Infinity. The disappearance gripped the nation's attention as the government struggled to provide information about the tragedy. At the time of the disappearance, the Navy said water that had entered the submarine's snorkel caused its battery to short-circuit. Naval officials said international organizations helping to search for the missing vessel a year ago detected a noise that could have been the submarine imploding. 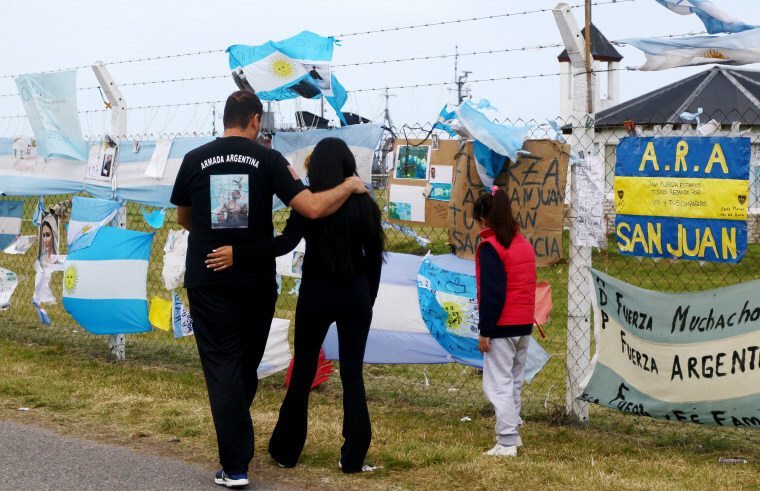 The first anniversary of the submarine's disappearance was marked with an event at the Mar del Plata naval base on Nov. 15, with President Mauricio Macri in attendance. The crew had been ordered to return to Mar del Plata on the country's east coast. But the vessel was never heard from again. The disaster spurred soul-searching over the state of the military in Argentina, which - after a series of financial crises - has one of Latin America's smallest defense budgets relative to the size of its economy.